About "LCM method to solve time and work problems"
On this web page, we are going to see LCM method to solve time and work problems. Let us look at the steps involved in solving time and work problems using LCM method. Further process from step 3 will be depending upon the situation given in the problem. It has been explained clearly in the example problems given below. Let us look at some example problems on "LCM method to solve time and work problems". 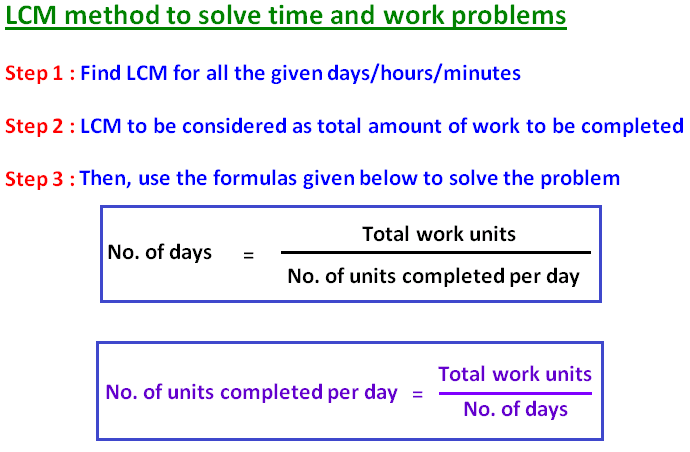 Examples on "LCM method to solve time and work problems"
A can do a piece of work in 8 days. B can do the same in 14 days. In how many days can the work be completed if A and B work together? Let us find LCM for the given no. of days "8" and "14". Let us look at the next example on "LCM method to solve time and work problems"
A and B together can do a piece of work in 12 days and A alone can complete the work in 21 days. How long will B alone to complete the same work? Let us find LCM for the given no. of days "12" and "21". Therefore, total work = 84 units. A and B together can do a piece of work in 110 days. B and C can do it in 99 days. C and A can do the same work in 90 days. How long would each take to complete the work ? Let us find LCM for the given no. of days "110", "99" and "90". Therefore, total work = 990 units. A and B can do a work in 15 days. B and C can do it in 30 days. C and A can do the same work in 18 days. They all work together for 9 days and then A left. In how many days can B and C finish remaining work? Let us find LCM for the given no. of days "15", "30" and "18". Therefore, total work = 90 units. A, B and C all work together for 9 days. Hence B and C will take 9 days to complete the remaining work. A and B each working alone can do a work in 20 days and 15 days respectively. They started the work together, but B left after sometime and A finished the remaining work in 6 days. After how many days from the start, did B leave? Let us find LCM for the given no. of days "20" and "15". Therefore, total work = 60 units. A is 3 times as fast as B and is able to complete the work in 30 days less than B. Find the time in which they can complete the work together. A and B working separately can do a piece of work in 10 and 8 days respectively. They work on alternate days starting with A on the first day. In how many days will the work be completed ? Let us find LCM of the given no. of days "10" and "8"
By adding (1),(2),(3) & (4), we get 36 units. That is, in 8 days 36 units of the work completed. These units will be completed by A on the 9th day. Hence the work will be completed in 9 days. Two pipes A and B can fill a tank in 16 minutes and 20 minutes respectively. If both the pipes are opened simultaneously, how long will it take to complete fill the tank ? Let us find LCM of the given no. of minutes "16" and "20"
Pipe A can fill a tank in 10 minutes. Pipe B can fill the same tank in 6 minutes. Pipe C can empty the tank in 12 minutes. If all of them work together, find the time taken to fill the empty tank. Let us find LCM of the given no. of minutes "10", "6" and "12"
A water tank is two-fifth full. Pipe A can fill a tank in 10 minutes and pipe B can empty it in 6 minutes. If both the pipes are open, how long will it take to empty or fill the tank completely ? Let us find LCM of the given no. of minutes "10" and "6". Already tank is two-fifth full. Out of 30 units, now the tank is 12 units full. Apart from the stuff and examples given above, if you want to know more about LCM method to solve time and work problems, please click here.